Earth rods and their fittings are used to provide the interface to ground in all soil conditions in order to achieve satisfactory earthing systems in overhead and underground electricity distribution and transmission networks – providing high fault current capacity on low, medium and high voltage substations, towers and power distribution applications. Convenient to install where the subsoil condition is free from rock and boulders the earth rod or group of copper rods can be surrounded or backfilled using a low resistance material such as Bentonite. 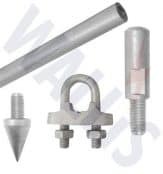 Depending on the corrosive condition and electrical conductivity of the ground condition the earth rod can be specified to achieve safe, reliable and long term earthing protection – the mechanical strength of the rod must withstand the abrasion and stress endured while installing with an electric or pneumatic driving rod hammer; the head of the earth rod should not “mushroom” or spread when driven. The earth rods are extendable by design and used with copper couplers to inter-connect several rods to achieve the required driving depth – the rod couplers provide permanent electrical conductivity and the longer copper earth rods access lower resistivity soils at at lower depths. Vertically driven earth rods are the most effective electrode for use in typically small area substations or when low soil resistivity ground conditions, into which the rod can where the rod can penetrate, lies beneath a layer of high soil resistivity. A common misconception is that there is a direct and positive correlation between the diameter of earth rod used and the effect on lowering earth resistance readings. Incorrect. 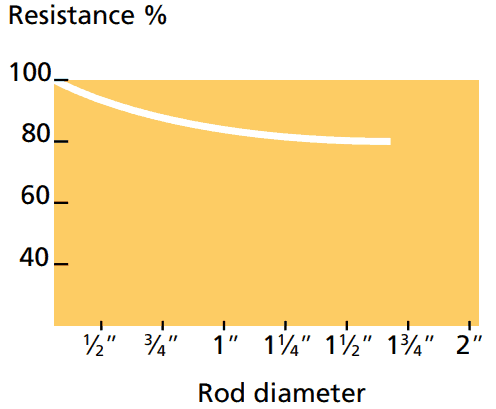 The graph below confirms that the resistance value is only lowered by 9.5% by doubling the diameter of the rod (which means increasing the weight and the cost of the rod by approximately 400%). Thus the rationale is: use the most economical earth rod that soil conditions will permit the installer to drive. Rule of thumb – doubling the radius of the earth rod will reduce resistance by approximately 10% and is not a cost-effective option. Doubling the rod length however will theoretically reduce resistance by 40%. Where additional driven earth rods are combined and connected they should be separated from each other and from any adjacent cables by a distance not less than the depth to which they are driven. Additional earth rods should be connected using copper tape or bare copper cable of the same cross sectional area as the earth electrode conductor. The additional electrodes should be placed so that any necessary separation of the LV and HV earth electrode systems is maintained. 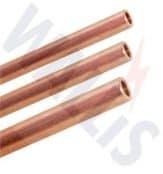 Copper is the optimal choice of earth electrode material and underground conductor – solid copper is recommended for high fault current installations whereas copper bonded rods are usually installed for smaller sections. 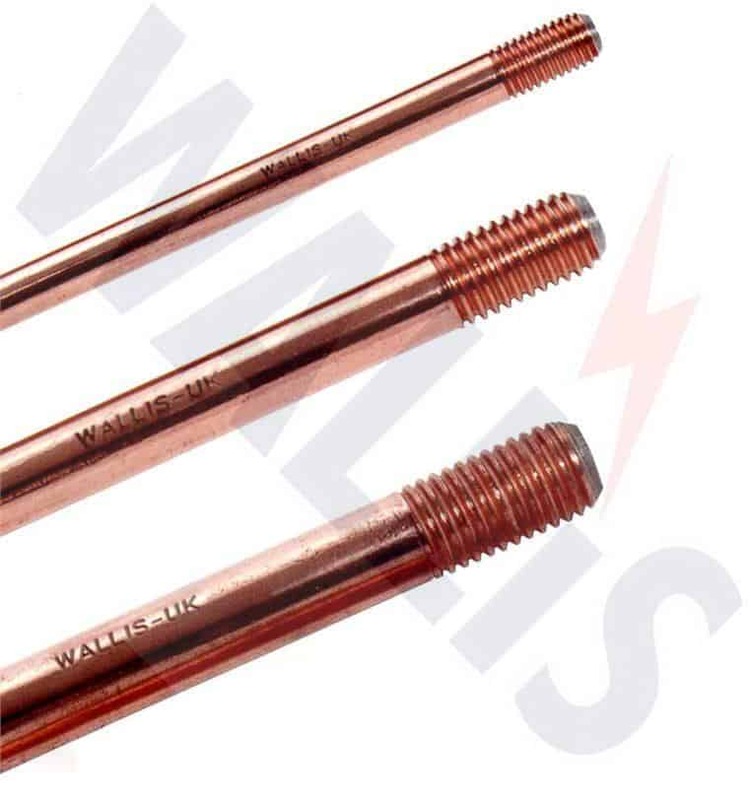 Copperbonded steel core earth rods are the most specified due to electrical and mechanical strength, resistance to corrosion as comparatively lower cost compared to solid copper or stainless steel types – the lowest cost galvanised rods for usually installed non-critical, short-term or temporary earthing requirements. Steel cored copperbond earthing rods are manufactured by molecularly bonding 99.9% pure electrolytic copper onto a low carbon steel core – copperbonded steel rods provide high mechanical tensile strength and corrosion resistance at comparatively lower cost than solid copper or stainless steel rods with a higher corrosion resistance typically for high salt and high resistivity soil condition earthing applications. Copper bonded rods and electrodes are suitable for deep driving into most ground conditions and provide a low resistance path to ground. Soil resistivity tests should be conducted prior to installing the earth rods to ensure acceptable soil resistivity readings – to reduce resistivity additional rods can be driven into the ground to increase density. 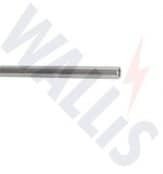 Earth rods manufactured from stainless steel are installed to prevent galvanic corrosion which occurs between buried dissimilar metals in close proximity. Earth rod electrodes are installed during the civil engineering works associated with substation construction – soil resistivity readings are taken and if “greater than 200Ωm (i.e. in arrears where the soil is made up primarily of slate, shale or rock)”ƒ, vertical earth rods are installed to reduce resistance. Note consult local UK DNO or utility recommendations which vary according to engineering standards and preferences. Safe working practices advise when driving earth rods all practical steps shall be taken to ensure that rods are not driven into any buried services below cable trench level such as gas, telephone, water or electricity cables. Contractors should consult the appropriate utilities’ records and the use of approved instruments for the detection of buried services may also be necessary – this is especially important when rods are installed after the completion of cable pulling and laying. Change of earth rod diameter has marginal impact on the overall value of resistance with the size more determined by the mechanical strength of the rod to withstand being mechanically driven when deep earth rods are required e.g. to depths of 20 metres or more. Driving copper earth rods is often conducted in built-up urban areas and the method should be used with care, caution and implemented measures to avoid accidental damage to buried utility services, such as 11kV/33kV high voltage cables. The rods are driven vertically into the ground and earth resistance is measured as each section is installed. Earth rods or copper electrodes are commonly installed into the concrete floor of the primary substation building to protect gas insulated switchgear (GIS) and earth bars are positioned either within or buried immediately outside the building walls – the electrode would be located close to either i) circuit breakers ii) cable sealing ends iii) SF6 or air bushing iv) instrument transformers or v) substation busbars. To minimise touch potentials the buried earth rod should pass in front of the switchgear. If this is not practical the installation of a copper earth mat in front of the switchgear where the operator stands is advisable, with duplicate bonds to the main earth electrode. HV earthing systems and combined HV | LV earthing systems connected to HV surge arresters or to HV equipment with arc gaps must be suitable for lightning protection. In these circumstances additional earth rods or additional copper electrodes in a “tee” or star configuration should be installed as close as reasonably practicable to the surge arresters and high voltage electrical equipment. At overhead line high voltages the earth rods are used for each phase arrester or capacitor voltage transformer (CVT) – typically for 11kV, 20kV, 33kV and 66kV pole-type surge arresters “the ideal arrangement is to have two down leads and earth rods connected down the H pole legs.” (Source: UKPN Document EDS 06-0013 Grid and Primary Substation Earthing Design 2015). The soil model and ground conditions are essential to an effective earthing system design where the soil resistivity values determine the type and length of earth rods required. When confronted by a difficult earthing design the standard approach is to supplement the bill of materials with additional conductors and earth rods – this is not always beneficial as costs can be expensive and rods in proximity to each other have reduced effectiveness. Contact us should you require technical support and specification guidance on selecting the correct earth rod to maximise earthing performance given various ground conditions and installation environments. Where hard ground conditions prevent manual driving of rods, drilling machines or rod hammers are used to penetrate the ground and can then be back filled with a low resistance earthing compound such as Bentonite. Additionally, Bentonite compound contributes to maintaining the earth resistance values at more consistent levels, protecting against 3rd party damage and protecting the rod from corrosion. ➡ View the complete range of Earth Rods below – this includes solid copper, threaded copperbond and stainless steel earthing rods for lowering the earth resistance of various soil conditions.